← Getting ready for the Holidays with Lil Luxe Collection Rouche and Division Top! 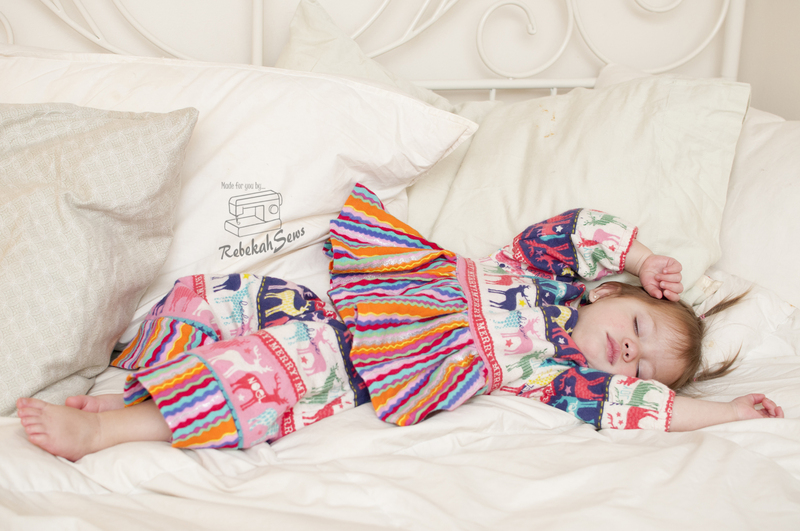 Sweet Dreams with Once Upon a Sew! Winter is here. Yes, I said it although I’m not too happy about it! I do try to look on the bright side of the chilly days and even chillier nights though. That bright side is very cozy too as winter sewing entails cozy material. I have just fallen in love with flannel this season too! 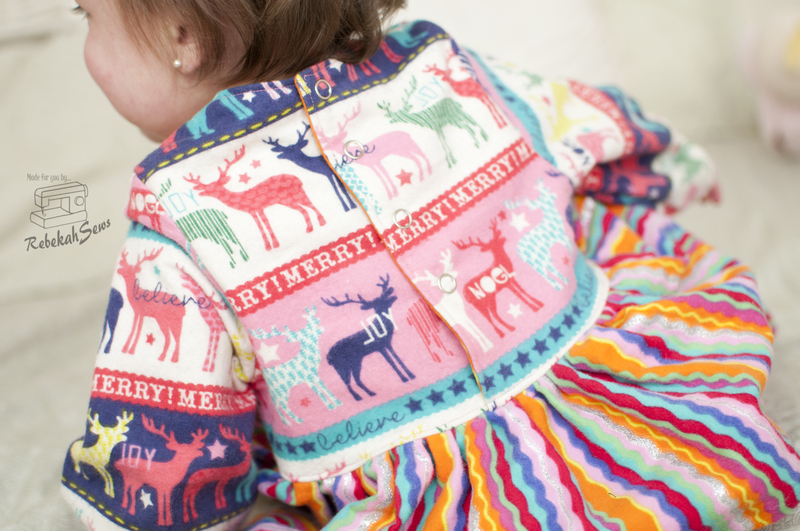 What better way is there to make use of flannel and sew up some holiday pjs? I have sewed many outfits, dresses, sweatshirts, etc, but I don’t sew many pjs. Not sure why to tell you the truth. Certainly something that will be changing! 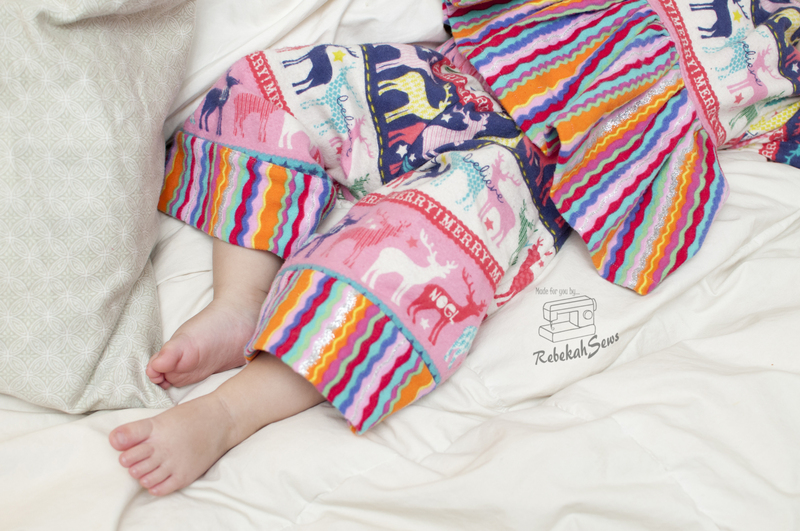 Today though I have a chance to introduce you to a set of pjs that are comfy, cute, and girly too! 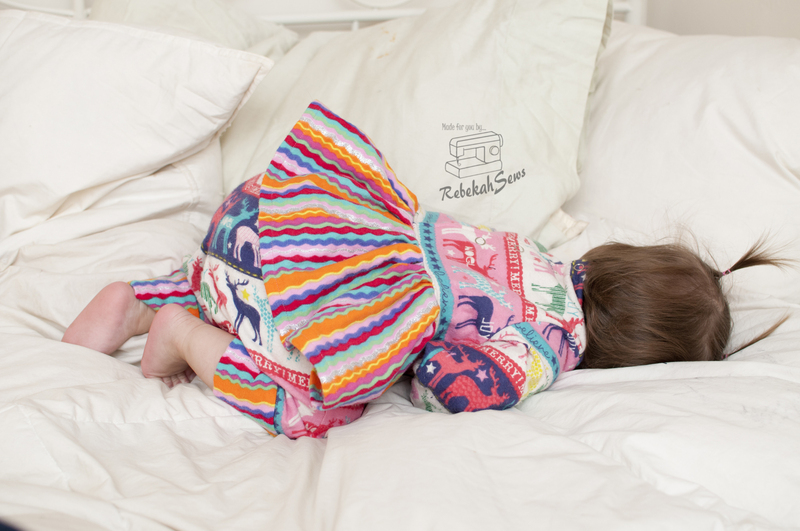 Take a look at the Ruffled Pjs by Once Upon a Sew! 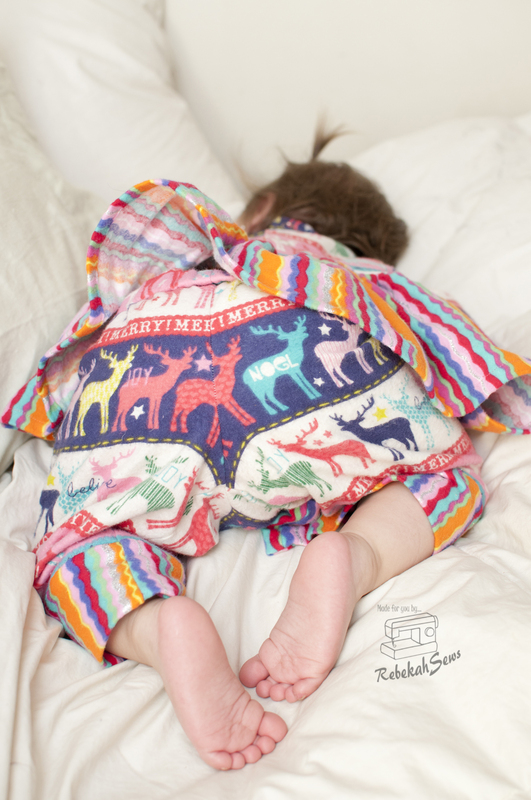 These are girls’ pjs that are made out of woven fabric and come in sizes 12mo-6. This is a 2-piece set with a top and pants. With an empire bodice with flowing skirt, this pj top is perfectly sweet. The top also features a lined bodice that closes in the back with buttons, snaps, or Velcro, and has elastic at the wrists. The pants have an elastic waist and can be created with or without the contrasting cuff. I am just in love with these! If I could fit into them I’d make myself a pair too! They look so comfy and cute to boot! I know I’m a little bias but I think my girl looks like a baby doll in her pjs. 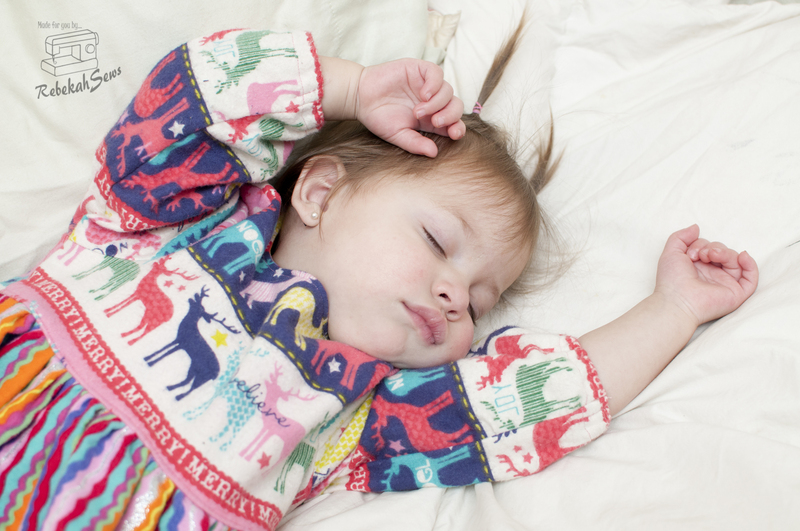 Before bed she is quite active however the Ruffled Pjs didn’t restrict her in any way. When she finally did give up the battle and surrender to sleep she looked so cozy in her new pjs. The fit is great! 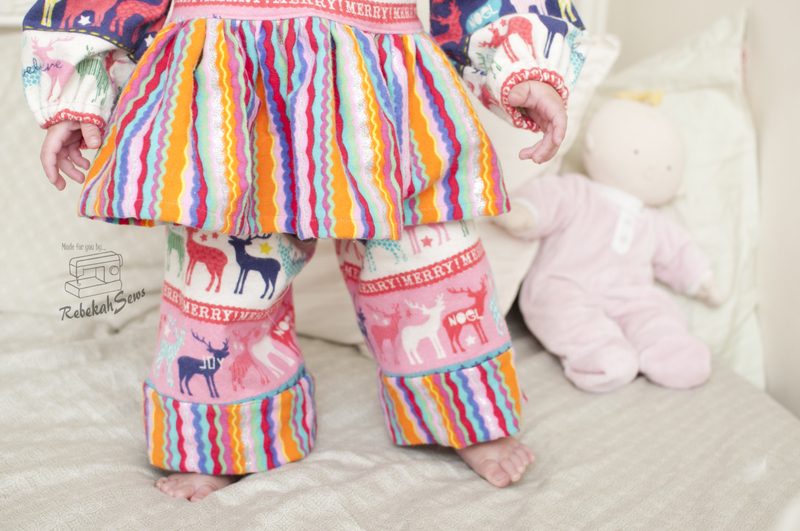 I made a size 12mo and they were roomy without being overly big. The pattern is very easy to follow and a beginner could certainly sew this up without any problems. It also didn’t take a huge amount of time too. For me I sewed these up in one afternoon or around 2-3hrs. I closed mine with snaps to make is quicker for dressing a squirmy toddler. I also didn’t put the extra ruffle in the bodice as I liked the look without. I will certainly be making more of these and already have more flannel! I am also tempted to make this as a regular outfit as it doesn’t need to be limited to just pjs either! If you have a girl then you need these pjs for her! I know there are many girls out there that don’t like nightgowns but have mamas still want to sew something a little girly for them. This is the perfect solution! Get your copy on sale for $5 over on Etsy with no coupon code needed. Don’t wait for too long though as it is only on sale till December 6th. 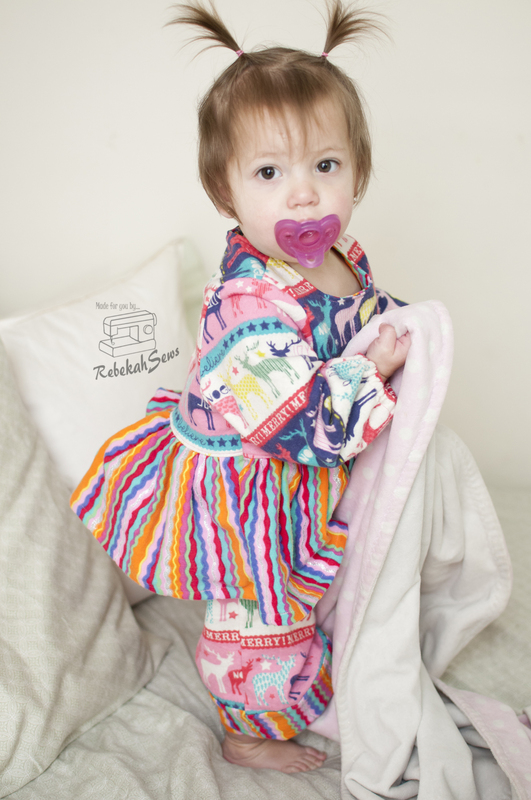 Also don’t forget to check out the Once Upon a Sewing Machine blog for all the other tour stops for more beautiful pjs! 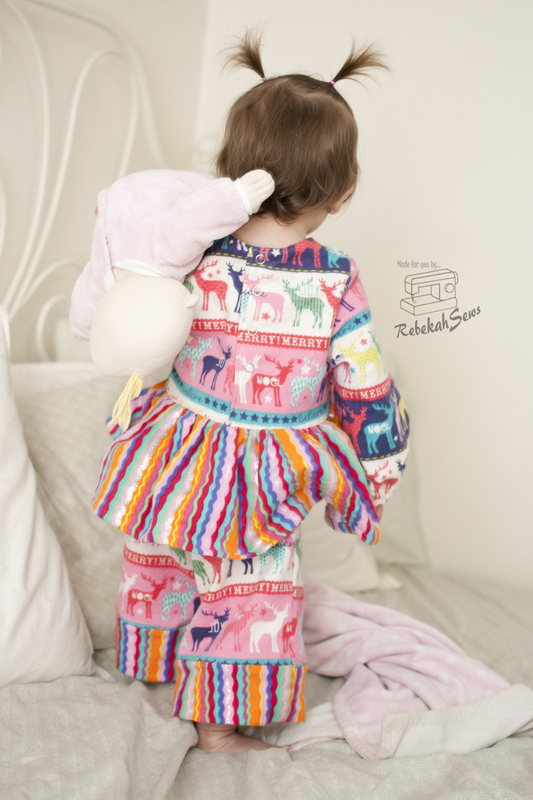 We love how these PJ’s turned out! The bright colors are perfect for the sometimes drab winter weather. The addition of the stripe as contrast is perfect. Thanks for coming along on our tour this week. Oh, I love your version! These are so much fun!